At vsource, we understand that we all have a role to play in making the world a better place. Through our corporate social responsibility programs, we support the charities and causes our team members admire. We accomplish this through our direct work with charitable organizations throughout Vietnam and through the career development and social environment we’ve developed for our staff in Ho Chi Minh City. vsource offers direct assistance to charities through our voluntary employee oraganization that we call the Big Smile Guild. All of our team members are encouraged to get involved with The Big Smile Guild and to suggest new causes for us to help. Since 2007, we have worked with many organizations, through funding, raising awareness and volunteer opportunities. In April and May 2018, vsource IT team refurbished and donated 40 computers to underprivileged schools in Vinh Long and Ca Mau provinces, Vietnam. These computers were available after we switched to system which allow us to reduce our carbon footprint. In May 2018, the Big Smile Guild visited the orphanage at Ky Quang Pagoda II in Ho Chi Minh City, bringing gifts of food and sundries to the more than 200 newborn and disabled orphans who live there. In addition to working with external charities, we believe that by investing in people we can make better lives for them and their families. This includes making training and upskilling programs available to our entire team and establishing well-defined career tracks that prepare our team with excellent opportunities for advancement. 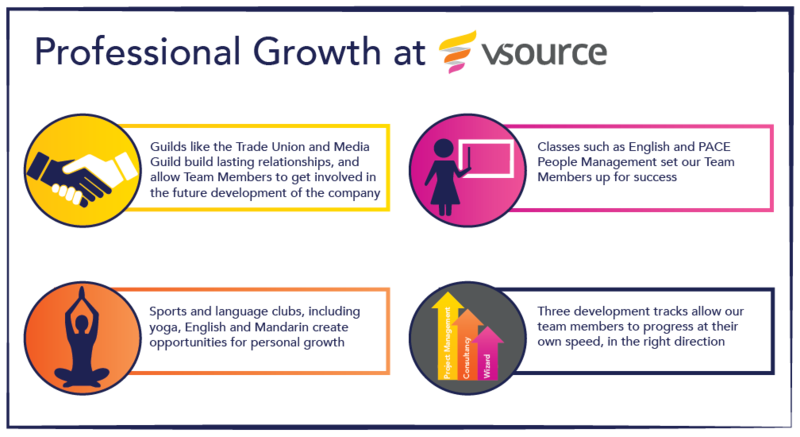 In addition to career development, education opportunities, and support schemes, vsource encourages workplace activities including weekly yoga classes, the Camera Guild, the Trade Union, Language clubs and company sports clubs. vsource sponsors the Ho Chi Minh City St. Patrick's Day festivities in 2018.